Options Action Chart Master, Carter Worth says it’s time to fade the Facebook 23% year-to-date rally. The relative strength index is in an overbought condition, the moving average convergence/divergence oscillator has been tracking in negative divergence to price, and Chaikin money flow dropped below its 21 period signal average. But oscillators can stay in overbought or oversold conditions for long periods of time and Chaikin money flow is still in positive territory. The Chart Master will, at some point, be correct but it is hard to short the “F” in the FANG acronym without further confirmation. The DJIA has been making lows at a fairly regular interval of 101 days. The cycle tools overlaid on the daily chart show the pattern, and the average is nearing another cycle low period. This suggests the index will transition out of the March downtrend over the next week. The money flow index, a volume-weighted relative strength measure, is moving higher after touching its oversold level. A break above the red downtrend line confirms the cycle low but that would have to be accompanied by a pick-up in volume and improving Chaikin money flow. The rally in McDonalds MCD has been interrupted by a month period of channel consolidation, and normally during a rally it is healthy for a stock to pause briefly and digest gains. In this case, however, the consolidation phase has been highlighted by a cluster of high wick candles, which may be signaling an end to, rather than a continuation of, the rally. A grouping of high wick or upper shadow candles reflects multiple attempts to hold the upper range of the channel at the $130.00 level, and coming at new highs after an extended rally phase, this is a bearish signal. Wednesday’s session formed a shooting star or a candle with a large upper wick and small opening and closing range at the lower end of the candle. IT closed the session near the intersection of channel support and the long-term uptrend line. 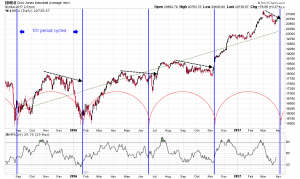 Moving average convergence/divergence has made a bearish crossover and is tracking lower in slight negative divergence to price, and the relative strength index has crossed out of its overbought zone and below its 21 period average. The recent consolidation has compressed Bollinger bandwidth to a level that, in the past, has been followed by volatile moves in the stock price. Accumulation/distribution has dropped under its signal average and these previous bullish and bearish money flow crossovers have been followed by higher and lower moves in the stock price. The combination of weak candle action and price momentum, as well as compressed bandwidth and negative money flow, is a formula for breakdown. McDonalds is a speculative short candidate after a lower candle close below $127.50 using a disciplined trailing buy-to-cover stop. Periods of low volatility as measured by narrow Bollinger bandwidth are often followed by volatility breakouts or breakdowns, and being prepared to catch the move is the strategy behind the “squeeze” play. Stocks with charts that reflect low volatility ranges or tight bandwidth, and defined levels of support and resistance offer that quick trading opportunity. Shares of the chocolate confectioner, Hershey Foods HSY have been rising since December last year and managed to close a long term gap last month. Since then, they have been moving in a small horizontal channel with resistance at the $110.00 level and support at the 50 day moving average, currently in the $107.00 area. 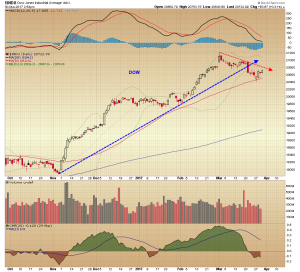 The stock price retested the upper end of the channel in Tuesday’s session but closed back off its high. Chaikin money flow is in positive territory and the relative strength index is above its centerline, so the technical indications point to an upside break. That said, the squeeze play has no particular bias and is short term in nature, so making a quick profit by trading either a breakout or a breakdown is the strategy. 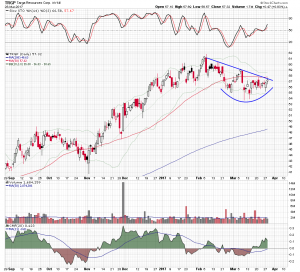 Lannett LCI is a generic drug manufacturer and price action in its shares has been forming a symmetrical triangle or wedge formation on the daily chart for the last five months. This week they moved back up to retest the pattern downtrend line and the stock closed near its high in Wednesday’s session. The relative strength index has moved broken above its 21 period average and center line, and the accumulation/distribution line is tracking above its rising signal average. 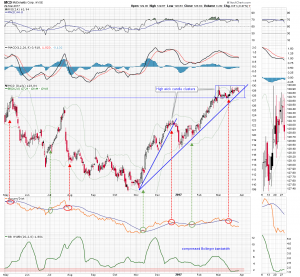 Its looks like another candidate to breakout but, again, let price determine the direction of the trade. 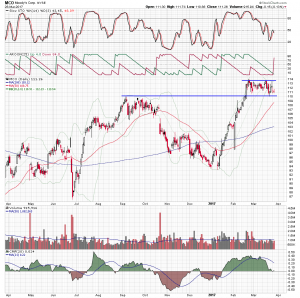 The financial ratings service company, Moody’s MCO has been trading in a channel pattern since March, but the stock price has shown signs of fatigue in the last three sessions and returned to the lower end of the channel. The stochastics oscillator is reflecting the decline in price momentum since the first week of March and the aroon indicator, designed to identify early shifts in trend, has made a bearish crossover. Chaikin money flow is suggesting a significant decline in positive money flow. Norwegian Cruise Line Holdings NCLH has been trading in a pattern of higher highs and higher lows since November 2016, but it has been bumping up against a stubborn ceiling of support in the $52.00 area for the last month. Moving average convergence/divergence is in slight bearish divergence to price and Chaikin money flow has dropped into negative territory. Let the clearly defined levels of support and resistance determine if the trend is your friend or if the rally is coming to an end. Targa Resources TRGP is a midstream energy services company and its stock price pulled back below a flat 50 day moving average last month forming a strong downtrend line above a rounded bottom. The trend line and the 50 day average were retested in Wednesday’s session, and the technical indications suggest a bullish break. Stochastics has been moving in positive divergence to price and is above its centerline, and Chaikin money flow moved into positive territory two weeks ago and is tracking higher. Price, again, is the final arbiter of the “squeeze” play, so be prepared to enter a trade quickly and exit just as quickly, taking either a fast profit or a small loss. Endologix (ELGX) develops and markets medical devices for the treatment of abdominal aortic aneurysms, and its stock price has been consolidating in an extremely narrow range since the beginning of the year. The technical indicators suggest a breakout is imminent and with a 24% short interest, there could be a sustained and powerful move. The daily chart is overlaid with a series of moving averages with the shorter periods in green and the longer in red. They form a ribbon that reflects price range and can be used to identify when the stock is trending or consolidating. The averages are very compressed, similar to the range seen in October last year just before the drop in the stock price, and have formed a narrow triangle pattern, under resistance in the $7.10 area. Daily moving average convergence divergence at the top of the chart, is overlaid on a weekly histogram of the oscillator. On the weekly timeframe, it made a bullish crossover in February and on the daily timeframe it is above its center line. 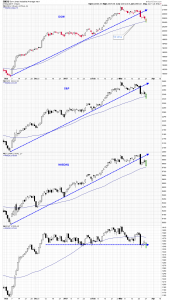 These indications suggest improving short-term price and trend direction. Overall volume is weak and will have to improve to support a rally, but Chaikin money flow crossed above its 21-period signal average and is well into positive territory. 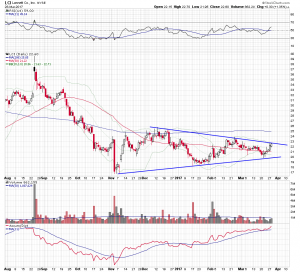 The stock is a long candidate after an upper candle close above triangle resistance, using a tight trailing stop. 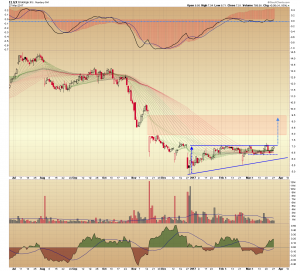 A confirmed triangle breakout projects a large percentage move back to the upper end of a wide gap in the $9.50 area. The S&P 500 Index, the DJIA, and the NASDAQ Composite Index opened lower today touching their 50 day moving averages but have managed to recover nearly all of the gap. On the Russell 2000 Small-Cap Index, the intermediate term horizontal resistance in the 1345 area has contained repeated retests and continues to do so again, at this point in the trading day. Follow-through action later this week is required before it is safe to say the markets are moving back on trend. The CurrencyShares Euro Trust ETF FXE has underperformed the PowerShares DB US Dollar Bullish ETF UUP by 35% over the last three years, but that relationship has shifted and the euro fund is now up relative to the dollar fund by 5% year-to-date. There has been price consolidation underway on both charts since last November, and simultaneous pattern breaks look imminent. The bearish UUP looks like it is preparing to breakdown through intermediate term support and the bullish FXE looks like it is ready to take out resistance. This negatively correlated price action suggests it is time to get on board the FXE as it continues on trend. On the FXE daily chart the five month consolidation process has formed a cup and handle pattern, with rim line resistance in the 105.10 area, which is the 38% retracement level of the 2016 range. 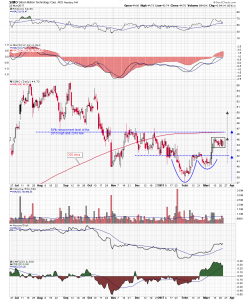 The cup and handle formations one of the more reliable technical reversal patterns and a confirmed breakout projects a target objective measured by taking the depth of the cup and adding it to the rim line. In this case, it suggests a move back up through the declining 200 day moving average and the downtrend line drawn off the lower 2016 highs, into the 109.25 area or approximately a 4% gain from the current level. Daily moving average convergence/divergence is overlaid on a weekly histogram of the oscillator and crossed above its center line on both timeframes. This is a reflection of increasing price momentum and positive short term trend direction. The bullish green-over-red crossover on the vortex indicator is a confirmation of the positive shift in trend. Overall volume has been improving and on balance volume and Chaikin money flow readings suggests the fund is seeing buying interest. In addition, there is a strong bullish seasonal tendency in the euro currency, and while the seasonal chart only goes back to 2013 pattern a relatively short look-back period, it is impressive. 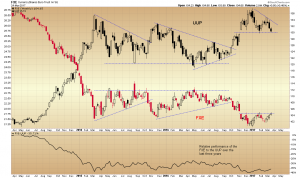 The FXE is a long candidate after a break above the 105.08 rim line resistance level using a trailing percentage stop. Shares of the fabless semiconductor designer, Silicon Motion Technology SIMO spent the last half of 2016 in a decline that saw them lose 30% of their value, but they spent most of this year forming a bottom. 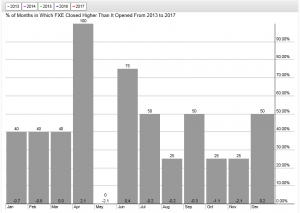 This month they have broken out of that base and have the potential to retrace over 50% of their previous loss. The consolidation this year took the form of a cup-and-handle pattern with rim line resistance in the $42.00 area. 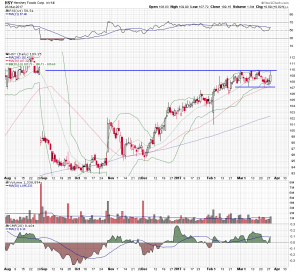 That resistance was broken this month and the stock jumped up to the $45.00 area, where it began trading in a small horizontal channel. The rim line breakout and the small channel that followed formed a flag pattern. 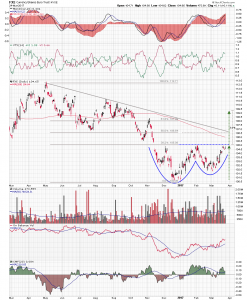 A price objective for the cup-and-handle pattern is measured by taking the height of the cup and adding it to the rim line and it projects a target price in the $46.50 area. This would be a 50% retracement of the 2015 high and the 2016 low range and a retest of the 200-day moving average. The flag pattern objective is measured by taking the height of the flagpole and adding it to the top of the flag, and it projects to the $50.00 area. 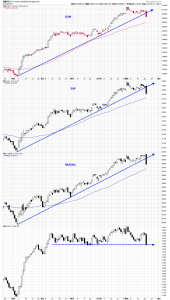 Technical indications support a second pattern breakout and continuation of this month’s rally. Daily moving average convergence/divergence is overlaid on a weekly histogram of the oscillator and is above its center line on both time frames, and the relative strength index is tracking above its rising 21 period average. These readings reflect positive short term price and trend momentum. The accumulation/distribution line moved above its signal average early last month and Chaikin money flow followed shortly after, suggesting the stock has been under increasing levels of accumulation. 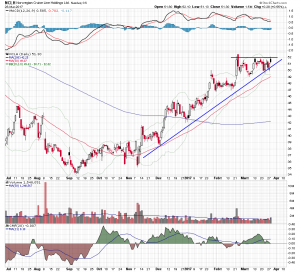 The stock is a long candidate after a break above the flag consolidation using a trailing percentage stop. Jim Cramer spoke with PVH CEO Manny Chirico about President Donald Trump’s effect on retail and the company’s strong earnings report. Here was our technical take on the stock prior to the release of the report. The rising November rally trend lines on the Dow Jones Industrial average ($DJIA), the S&P 500 Index ($SPX), or the NASDAQ Composite Index charts have been broken with the indices closing near their lows of the Tuesday session, while the underperforming Russell 2000 Small-cap Index, retested the horizontal support line in place on its chart since the end of 2016. A pattern on the S&P 500 daily chart of successfully retesting important levels of resistance-turned-support and then moving higher has failed, along with the rising trend line drawn off the November 2016 and February 2017 lows. 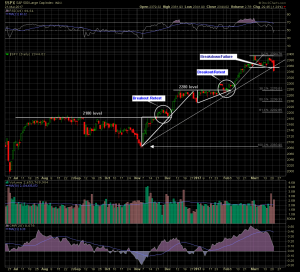 The nearly five month rally that had seen the S&P rally 15% may need a pause and a period of consolidation or pullback. 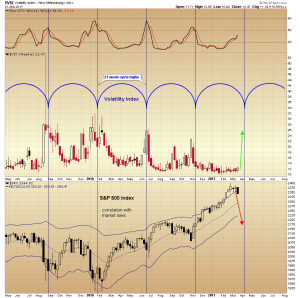 How long the pause or deep the pullback remains to be seen, but with the Volatility Index $VIX nearing a potential cycle high period, there is the possibility of large moves on the stock index. Interestingly, the indices gapped higher at the start of the session but then immediately reversed and the relentless selling began as evidenced in the price action and the volume. Tuesday was a disconcerting day not because of the percentage decline but because of the lack of an initial catalyst, however read Jim Cramer’s take on the potential problem published on TheStreet.com this morning.